Named "Canada's Prettiest Town," Niagara-on-the-Lake is set at the south shore of Lake Ontario at the mouth of the Niagara River. As one of Canada's top culinary and wine destinations, the Niagara Region features over 85 wineries and numerous award-winning restaurants with farm-to-table cuisine. 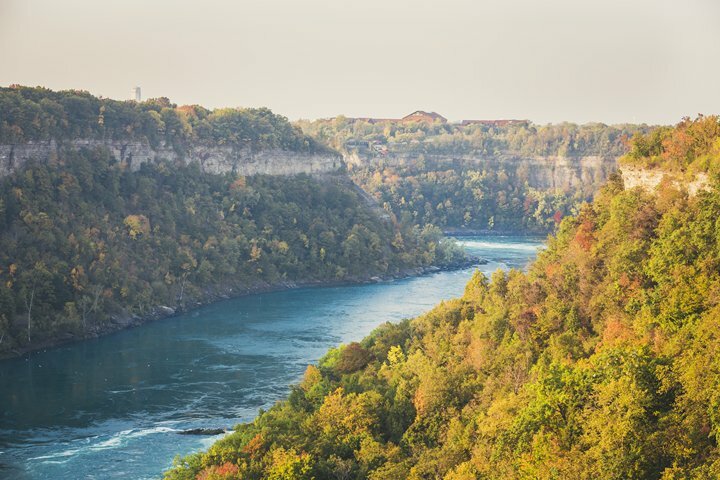 Enjoy a short scenic drive along the Niagara Parkway and experience the awe-inspiring Niagara Falls. Sir Winston Churchill once called this "the prettiest Sunday afternoon drive in the world"! Click here to discover more about the Niagara Region! Niagara-on-the-Lake is located approximately 40 miles from Buffalo Niagara International Airport and 120 km to Toronto Pearson International Airport. From Toronto and destinations east/west via QEW: Follow QEW towards Niagara. After crossing the Garden City Skyway at St. Catharines, exit QEW at 38B, follow the Niagara-on-the-Lake signage onto Highway 55. Take Highway 55 12km northeast until it ends at Queen Street. Via Buffalo: Take the QEW to exit 38 and follow the signage onto Highway 55 and into town as above. OR - follow the signage at the Peace Bridge to the scenic Niagara Parkway and follow it from Fort Erie to Niagara-on-the-Lake. Via Lewiston: Cross the Lewiston-Queenston Bridge, take Regional Road 89/Glendale Exit and follow signage to Niagara-on-the-Lake.